The development of effective vaccines and widespread vaccination have helped eliminate the risk of contracting many preventable, deadly illnesses in the United States. However, misguided fears about vaccine safety have contributed to lower vaccination rates, encouraging new outbreaks of vaccine-preventable diseases such as whooping cough and measles. 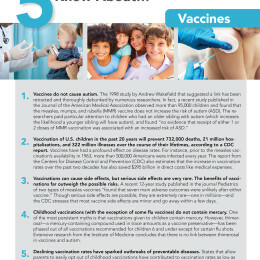 You can learn more about vaccine safety and the public policy consequences of allowing parents to opt out of vaccinating their children in our research brief, 5 Things to Know about Vaccines.